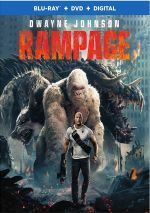 If a project would finally top 2001’s Lara Croft: Tomb Raider as the highest-grossing video game-based movie in the US, 2018’s Rampage seemed like a good candidate. A wild action flick with enormous monsters and “A”-list actor Dwayne Johnson, it felt like a lock to earn big bucks. Or maybe not. 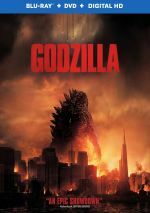 Worldwide the film did fine, with an international take of $424 million, but here in the States, the movie couldn’t even crack the $100 million barrier, as it fizzled to a disappointing $98 million. Someday a video game movie will top Croft in the US, but I’m shocked it’s taken so long. I can’t claim that Rampage deserved this honor, though, as it provides wholly mediocre action material. A primatologist at a San Diego wildlife sanctuary, Davis Okoye (Johnson) enjoys a strong bond with a silverback gorilla named George. This relationship goes through a test when George experiences radical physical changes. A genetic experiment creates these concerns, and they cause George to grow to an immense size and become much more aggressive. This also impacts a few other animals, all of whom lay waste to parts of the US while Davis attempts to find a way to help his friend – and to prevent massive destruction. Dwayne Johnson seems to be the king of the forgettable action movie – at least those he headlines on his own. The additional cast added some spark to Jumanji: Welcome to the Jungle, but like San Andreas, Rampage finds Johnson as the only bankable star. Also like San Andreas, Rampage acts as generic action fodder - which seems like a shame, as it boasts the potential to become much more than that. Ignore its video game origins and you have a movie in which giants animals battle each other - how could that be boring? In this case, it's not truly dull, but it's also not especially exciting. There's a certain lack of drama or peril on display, as one never really senses danger - not for the "good guys", at least. It probably doesn't help that Johnson's character should die at least 47 times during the course of the movie but comes away with barely a scratch. Even by action movie standards, it's absurd how much damage he takes without any lasting concerns - I can stretch credulity a lot in a movie like this, but matters become ridiculous. Rampage brings us occasional bouts of action-based fun, but it seems like a disappointment in the end. The premise enjoys too much potential for it to wind up as such a mediocre film. 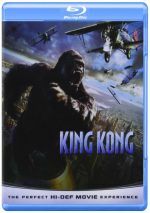 Rampage appears in an aspect ratio of approximately 2.40:1 on this Blu-ray Disc. This became a largely strong image. While most of the movie presented nice clarity, some wider shots looked a bit tentative. Still, the majority of the flick appeared solid, and no signs of moiré effects or jaggies occurred. The movie also lacked edge haloes or print flaws. In terms of palette, Rampage favored a combination of teal and orange. Those choices came as no surprise, and the Blu-ray reproduced them in a satisfactory manner. Blacks showed strong depth, and shadows were good, with nice opacity and clarity. All of this was enough for a “B+” that lost points solely due to the occasional slightly soft shots. 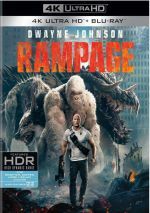 I felt more consistently pleased with the excellent Dolby Atmos soundtrack of Rampage. Downconverted to Dolby TrueHD 7.1, the soundscape offered frequent room for information to emanate from the various speakers. The mix used those chances well. The soundtrack delivered wall-to-wall auditory material that spread out across the speakers in a satisfying manner and that blended together nicely. This meant a tremendously active track in which the surrounds worked as nearly equal partners and kept the mix humming. Plenty of action/disaster moments made this a consistently impressive soundfield. Audio quality also satisfied, as speech was natural and concise, while music sounded peppy and full. Effects turned into the primary factor, and those elements appeared accurate and vivid. Bass response added real depth and rocked my subwoofer. If you own a fancy-pants home theater, you spent that money for soundtracks like this. Five featurettes pop up here, and these start with Not Just a Game Anymore, a six-minute, 15-second reel with producers John Rickard and Beau Flynn, director Brad Peyton, video game animator/designer Brian Colin, writer Brad Engle, executive producer Jeff Fierson, and actors Dwayne Johnson, Joe Manganiello, and Malin Akerman. “Anymore” looks at the source video game and its adaptation on the big screen. It gives us a quick but enjoyable overview. With Actors in Action, we find a 10-minute, 45-second piece with notes from Peyton, Johnson, Manganiello, Flynn, Rickard, stunt coordinator Allan Poppleton, producer Hiram Garcia, military advisor Patrick Brown, armorer Larry Zanoff, and actors Naomie Harris, Jeffrey Dean Morgan, Matt Gerald, Urijah Faber and Marley Shelton. As implied by the title, this show focuses on the cast, with an emphasis on their involvement in the movie’s action beats. It leans toward a lot of praise but it throws out a few decent nuggets along the way. During the 10-minute, eight-second Trio of Destruction, we hear from Johnson, Peyton, Flynn, Rickard, VFX onset supervisor Stephen Unterfranz, production designer Barry Chusid, VFX supervisors Erik Winquist and Colin Strause, executive producer Marcus Viscidi, and animation supervisors Aidan Martin and David Clayton. “Trio” examines creature design and execution. It turns into a tight little overview. Attack on Chicago goes for 10 minutes, 23 seconds and delivers remarks from Johnson, Flynn, Peyton, Chusid, Unterfranz, Winquist, Viscidi, Strause, Rickard, Winquist, Garcia, VFX supervisor Jonathan Nixon, construction coordinator Jonas Kirk, and actor Jake Lacy. “Attack” looks at aspects of location shooting and the Windy City’s integration into the movie’s often CG world. Too much praise results but we still learn a decent number of insights. Finally, Bringing George to Life fills 11 minutes, 53 seconds with comments from Flynn, Johnson, Peyton, Garcia, movement coordinator Terry Notary, Morgan, Harris, Martin, and actors Jason Liles, Skye Notary and Willow Notary. “Life” looks at elements involved in the presentation of George, with an emphasis on the performance capture work. It offers some useful info. Seven Deleted Scenes take up a total of 10 minutes, 12 seconds. Most focus on additional info about supporting characters, and we also see minor alternates for a sequence that show George’s fate. Of the bunch, the most intriguing comes from a teaser that would’ve pointed toward a second Rampage film. It also includes a cameo from Alexandra Daddario, Johnson’s San Andreas co-star. It’s the most fun of the snippets. A Gag Reel runs two minutes, 43 seconds and provides a standard mix of silliness and mistakes. It’s forgettable. The disc opens with ads for The MEG and Tomb Raider. No trailer for Rampage appears here. Despite a ton of action and the potential for excitement, Rampage seems oddly flat. It feels like it should dazzle and delight but instead it just ends up as minor entertainment at best. The Blu-ray delivers largely positive picture along with excellent audio and a decent array of supplements. Rampage should’ve been better.